M3 medium tanks on maneuvers at Fort Knox, Kentucky. It's likely these tanks were part of the 8th Armored Division. From June 1942 to January 1943, the Division conducted training of 10,833 cadre personnel for the 9th to 14th Armored Divisions at Fort Knox. The Armored Force School and the Armored Force Replacement Center were officially established at Fort Knox on December 1, 1940. The school trained armored force soldiers in military fundamentals and in specific areas such as tank gunnery, armor tactics, communications and maintenance. As the armored force grew and the U.S. entered World War II, the school expanded proportionately. From an initial cadre of 155 officers and 1,458 enlisted men in October 1940, the school grew to more than 700 officers and 3,500 enlisted men by May 1943. The school alone used more than 500 buildings, many of them "temporary" wooden structures built to meet the expansion of the post. Many of these "temporary" buildings are still in use today. The Armored Force School, at the peak of its operation during the war, operated on two daily shifts to satisfy the demand for qualified armor soldiers. The training reflected the rapid evolution of armored warfare doctrine, which changed constantly in the face of battle experience and in the alterations to the force structure and its tables of organization and equipment. Some of the buildings used by the school reflected these new doctrines and techniques. Building 1538, just off First Avenue (now Eisenhower Avenue), was built in the shape of a Landing Ship Tank (LST) to train soldiers how to load and unload armored vehicles for transport at sea. The building still stands today and is used by the Patton Museum for storing historical armored vehicles. By 1943, Fort Knox had expanded to 106,861 acres and had 3,820 buildings, compared to 864 buildings in 1940. Two-thirds of Fort Knox is slated for demolition by 2010. 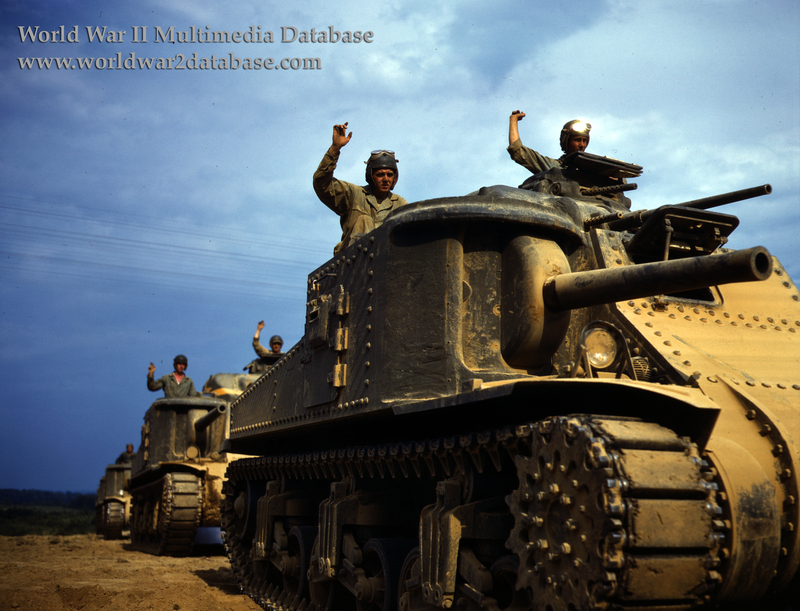 The M3 medium tank was designed in 1940, when the M2 series was found to be deficient in firepower. The riveted construction, high silhouette, and the 75mm sponson mounting (which required the entire tank to be turned to aim) seriously limited performance against German tanks. Against the Japanese, the M3 performed well at Makin Atoll in November 1943 and in stopping the advance on Imphal in early 1944, because the Japanese tanks were not as advanced as the Germans. Photographer Alfred T. Palmer (1906-1993) traveled around the country photographing war-related activities in 1942 for the Office of War Information.